The Rossies boss says it costs an estimated €15,000 per week to turn out the senior team. THE BATTLE WHICH most counties face trying to finance modern GAA teams has been illustrated by Roscommon with manager Kevin McStay saying it will be tough for him to shave any more from the estimated €15,000 per week that it costs to turn out the senior team. McStay paid tribute to all the Roscommon supporters and business who raise funds and says he hopes to avoid the embarrassment of being unable to pay for vital team services in 2018. The €15,000 a week cost, which was disclosed at the recent Roscommon convention, covers all costs associated with the team throughout the year including transport, meals, training costs, gear and other expenses. 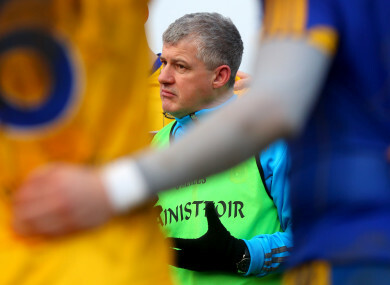 In his first year in sole charge of the team McStay led Roscommon to the Connacht title, but after a long season culminated with a replayed defeat to Mayo in the All-Ireland quarter-final, he admits it was a struggle to fund the team. The Roscommon management has already appeared before the county’s interim finance committee, which has a representative from Croke Park involved to sort out Roscommon’s long-term cash flow problems, where his budget for the season was approved. Cash injections from the summer’s fly-on-the-wall video documentary went straight into funding a hotel stay in Dublin, and next year McStay’s side have relinquished a mid-season training camp to trim the costs. He knows it will be a tough year ahead to make ends meet. “It was tight. Very, very tight. I don’t mind saying that documentary you all saw, that money went towards the hotel. That’s where we are,” said McStay. “I won’t be discussing (details) but the budget is done. The budget is signed off, it’s agreed. My budget had to go in front of the Croke Park interim finance committee. Everything is being watched here. “There was certainly a difficulty around it and you’d prefer if it hadn’t to be that way. But that where some of the counties are. They are living from week to week, month to month, trying to (survive). Speaking at the recent Roscommon convention former county treasurer Seamus Maher said it costs a ‘frightening’ €15,000 a week to keep the senior team on the road. Maher also revealed that the Croke Park interim finance committee had to come into rescue the county due to an initial creditors bill in excess of €550,000. That tally is now well reduced thanks to advances on grants from Croke Park, but McStay is still required to run a tight ship. “You saw there is a very big creditors list from convention, but at least they are bringing in serious money. The terrible thing is that these creditors are the best and finest people here in the county of Roscommon, GAA people providing services. “And then they don’t get paid, and then you go back to then to being Club Rossie members after doing work that they weren’t paid for. It’s a vicious circle. Fellas are getting fed up and then that hurts the finances. “I have asked people to join our backroom team, professionals who are providing a service. We agree a fee – it is never slaughterhouse money – and then they find after they have done the (job) that they don’t get paid at the end of the week. “That’s very tarred on me, who are they ringing when they don’t get paid, they don’t ring the chairman, they ring me because I was the one that invited them in. Email “'It was very, very tight' - McStay admits funding modern GAA teams is a struggle”. Feedback on “'It was very, very tight' - McStay admits funding modern GAA teams is a struggle”.